Fall is a time for homecoming. As families and friends gather, the home feels even more like a home. Windows are lit with a butternut glow in the earlier nightfall. Homemade quilts are pulled out from the back of dusty closets. Spices, like rosemary and nutmeg, draw people into kitchens. In the season that slows down, it is a time to cherish the company of families and friends. Each piece in the curated collection, Art for Autumn, can accent fireplaces, spark discussion, and enrich the time spent with friends and family, all while capturing the golden warmth of the season. 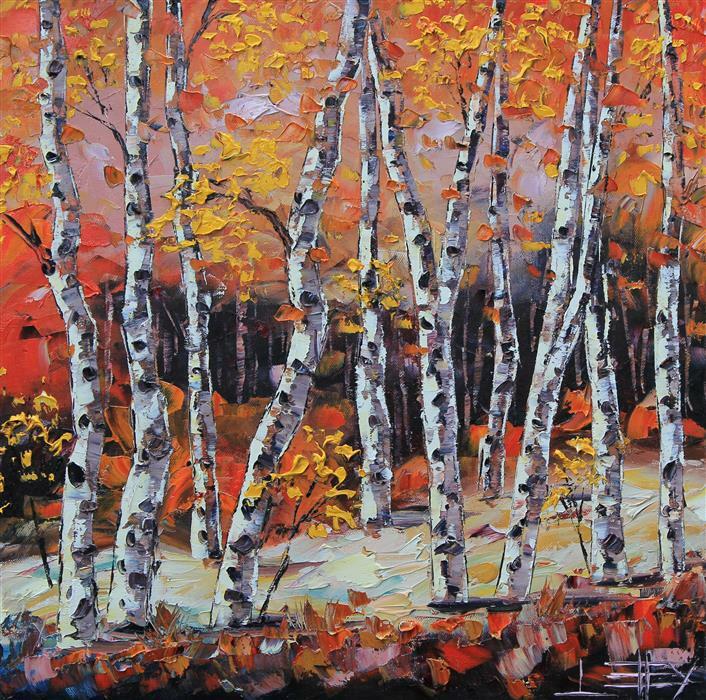 This painting by Lisa Elley, also known as the palette knife queen, was inspired by the beauty of birch trees. She poetically describes a birch tree as it "resonates with a poetic symphony of turning leaves, crisp, bright earthy colors, and textured white bark." The birches are harbingers of fall and are deeply nostalgic. Her palette knife technique evokes the sense of dry leaves layered at the base of a tree. Heather Patterson gives a poetic carpentry. She harvests new life for the wood she finds. The materials from her sculpture What is Seen vs. What is Said were collected throughout her travels. The wood is from abandon barns from Maine, kitchen remodels from Massachusetts, and a razed rectory from 1893. Nostalgic Lincoln log games, hikes through tree trunk woods, or collecting from the pile of firewood, the sculpture kindles the familial warmth of the fall. Yellow Creek showcases fall’s colors beyond the traditional cannon of red, yellow, and orange. In an oblique, expressive way, Robert uses pink, purple, and green to create the colorful sensation of fall. Robert unifies the planes of his landscapes with the gold tree. Through contrast, the tree juts forward as the focal point of the canvas with subtler, related tones echoed through the rest of the composition. 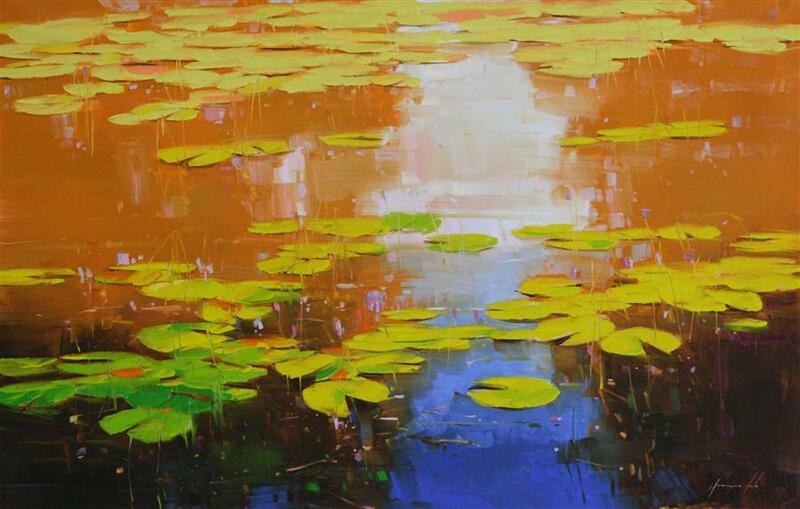 Vahe Yeremyan’s oil painting, Nymphaeas Tropical Waterlily is an impressionistic waterscape of a lilypad pond created with a palette knife. The composition shows a natural gradation from shadows – that fades from an illuminated gold at the top of the canvas to a dark brown and blue at the bottom of the canvas. The natural movement between colors parallels the changing of the seasons. The works in the Art for Autumn collection will warm the home with the best of the season. Whether through earthen tones, woodsy materials, or home life vignettes, each work of art in this collection captures the essence of the fall. See the full Art for Autumn collection on UGallery.